"Traditional Mexican Posole is served with shredded cabbage, lime wedges, avocado, onion, cilantro, and, of course, warm tortillas. 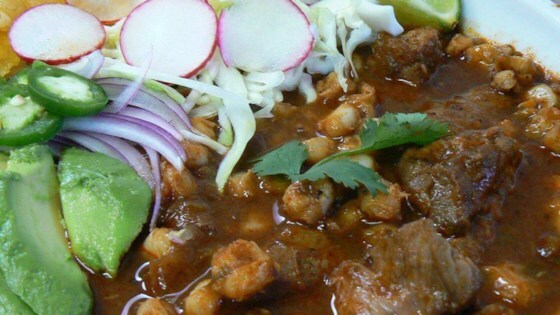 Many Mexican markets have posole meat already chopped up for you. You can add another can of hominy if your slow-cooker is large. I prefer hot enchilada sauce with salsa, but the regular kind will do." Cover, and cook on High for 6 to 7 hours. Stir in the cilantro and salt. Cook on Low for 30 minutes more. This recipe was SO good! My husband is mexican and he loved it! The only thing was that it needed a little more salt, but other then that, it was great!